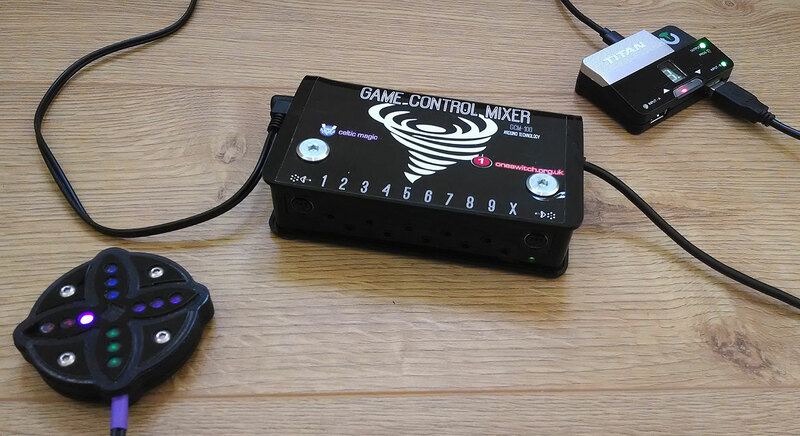 The Game Control Mixer (GCM) is a powerful accessible gaming system. A wide range of input devices including switches, joysticks, joypads, speech and more can be mixed together to form a single player controller. A special "SHIFT" switch enables players to reach more controls than they may be able to otherwise. 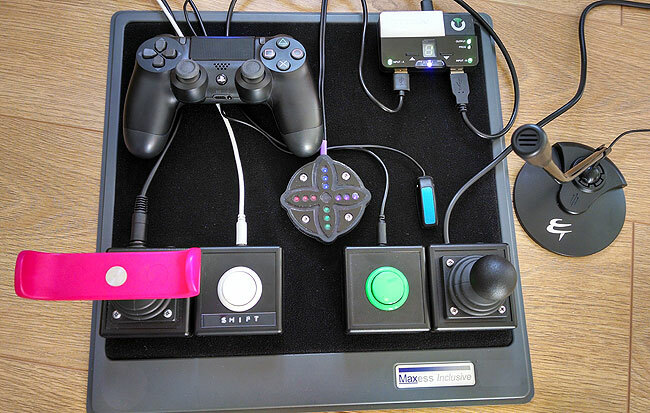 Up to 4 joysticks can be set individually to one of 24 different play modes. Mix these as needed at any time. Please get in touch for more information, customisation and purchasing details. 1 stick + 1 switch (or sip) enough to reach all joypad controls. PC, Xbox, Playstation, Nintendo Switch, RetroPie compatible. See the instructions for a full list. Works with standard accessibility switches. 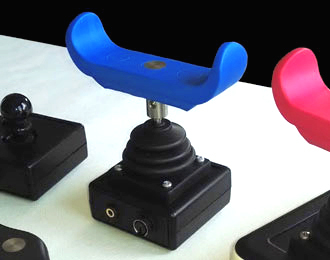 1-4 joysticks can each be set to one of 24 modes at any time. A wide range of plug in joysticks are available for the GCM100. Use an attached joypad controller as part of your controller mix, or use with a helper as a "co-pilot" controller. 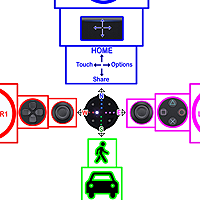 Mix and share out controls to make many previously inaccessible games accessible. Suits a huge range of abilities. Attach a Windows PC to mix in extra controls such as speech, on-screen keyboards and so on. Further customisation is possible upon request, such as increasing joystick sensitivity and changing switch socket functions. This works best with the GCM100 kit. A restricted access option can be included, where it's impossible to use the Home and menu buttons. Useful for players getting lost in menus and for use at shows. For PC use, the unit can be forced into PS4 mode to work with Playstation services, and Xbox 360 mode for use with Steam on the press of a button. Joystick modes include: left-stick, right-stick, d-pad, menu buttons, shoulder buttons, driving mode (standard and speed restricted), explore modes, six-axis and PS4 touch-pad emulation. One-Switch Joystick mode: Sticks can be turned into a simple "A" or "B" button (aka Cross or Circle). Perhaps for foot control. 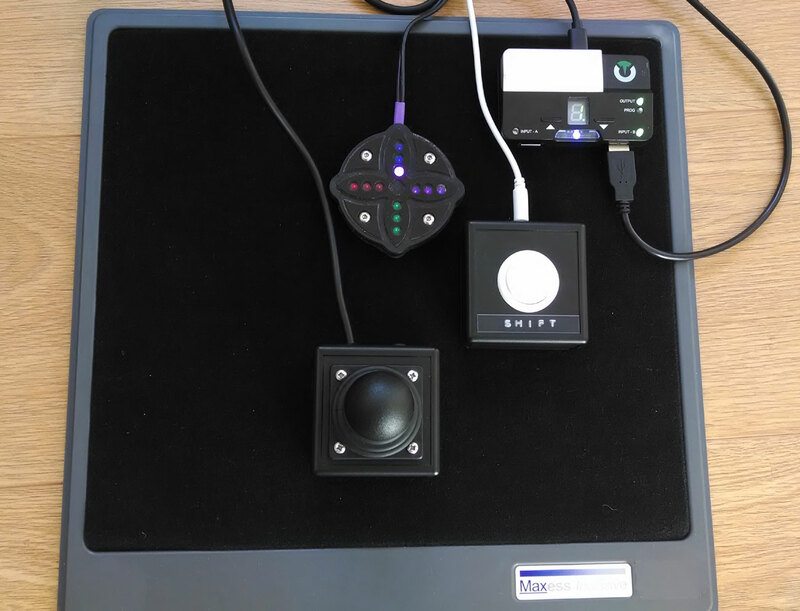 The kit can be used as a Mouse controller on a Windows PC using JoyToKey. Use to browse the internet and much more. See a video of this in action here. Joysticks connected to the GCM100 have advanced callibration making them very accurate in use. Adapter kits can make connection possible to Android, Playstation 2 and Dreamcast. Sip-Puff possible to be retro-fitted or purchased up front. 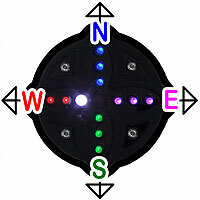 LED Compass display helps players remember what mode they are in. GCM100 only. A Titan Two on its own can be supplied for XAC and C-SID users with some reduced functionality compared to the GCM100. Created by Celtic Magic and OneSwitch.org.uk with support from ConsoleTuner.com. Games - see the video above for a handful of examples. A large number of games can be played with a single stick and one or two buttons or switches that were never originally possible to play indepdendently. Sharing controls can make for fun team play. From a single switch upwards. 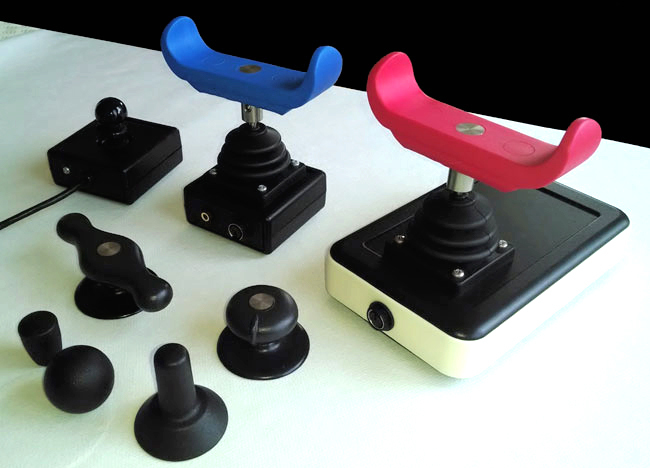 Joysticks: Some of the joysticks available for the Game Control Mixer. See the accessories section above or get in touch. GCM100's come supplied with an LED compass. This shows the current joystick mode for 1-4 sticks. GCM100 Instructions - including help guides. 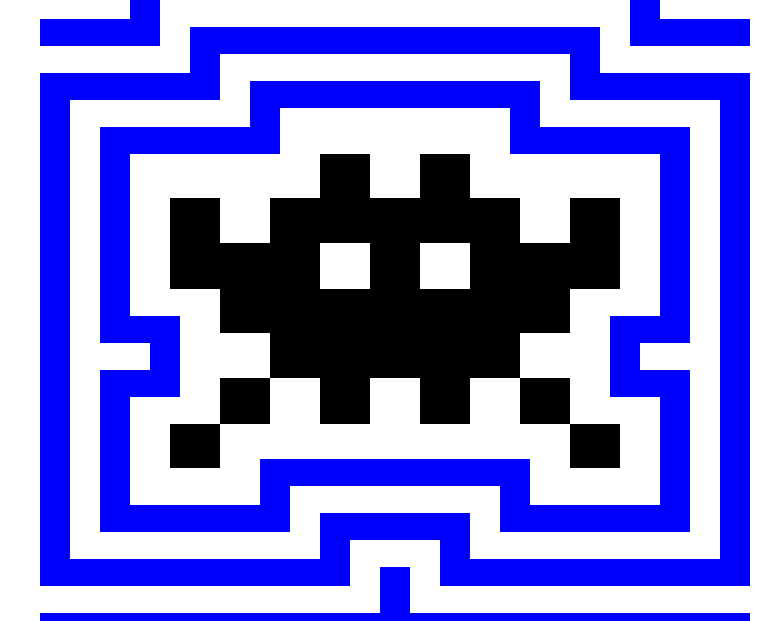 GCM100 XAC and C-SID Instructions. Accessible Gaming Shop - More switches and mounting solutions. Also, many more complex devices that may work in the mix of GCM100 and Windows PC connection. 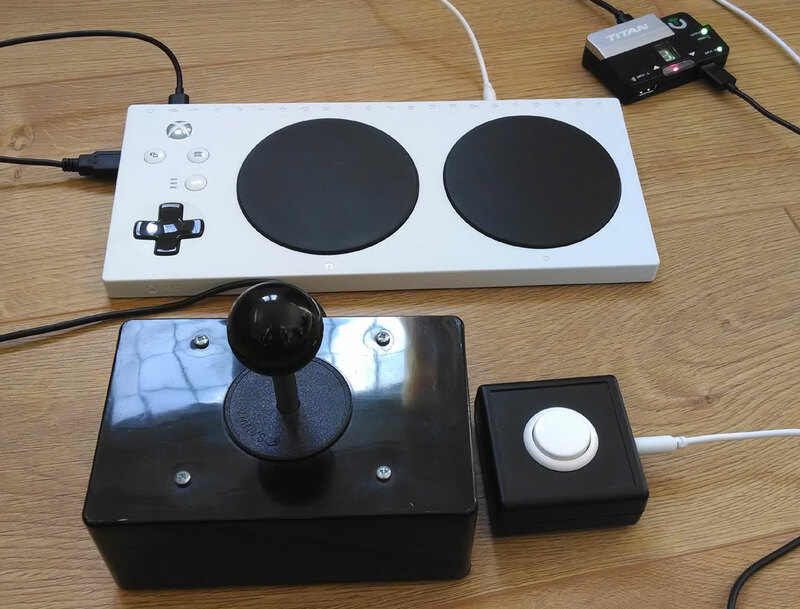 One Stick and a few Buttons - Including many games playable with one-stick alone. D.I.Y. Guide - Build your own switches.